The village of Canewdon is steeped in history, and has such a ghostly reputation that the local police actually section off part of the village around the church to deter an influx of visitors around Halloween who are all eager to test one of the villages ghostly tales. The village stands on one of the highest hills on the Essex coastline, and the name came from the Saxon term for 'hill of the Cana's people', though many people believe it was named after Canute the Great, who invaded the area in 1016. When the village first appeared is unknown, as people have inhabited this area of land since at least between 4000 and 2000 BC, and this long history seems to have paved the way for a huge amount of ghost storied. The village is also famous for being the home of Agnes Morley, who was the first person to be killed in mainland Britain during world war one after a zeppelin dropped an incendiary bomb on her home. She received a heroines funeral and the news was widely reported across the nation at the time. 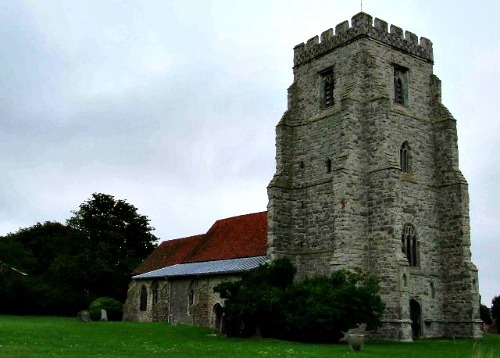 The villages most famous site is definitely St Nicholas church, which is also thought to be the most haunted and also the area were the local police section off at Halloween, since it has the most "try-able" ghost stories related to it. It was built in the 14th century with its tower being added during the 15th, and has acted as a very important building during its lifetime, with acting jobs such as serving as a look out over the river for Queen Elizabeth I, and as an observation post during the 1st world war. The old village lock up and stocks are located just East of the church and the whole grounds are well worth a visit if you are ever close to the village. There are many who would claim Canewdon to be the most haunted village in England, though it certainly cant beat the number of ghosts that linger at places such as Pluckley in Kent. Most of the tales of the villages hauntings are focused on the witch's who used to live and practice here. Claims of witch's are their magic are spread across the whole of Britain with tales of ghostly happenings still occurring today because of their deeds, but most of these normally turn out to be nothing more than a story. One thing that Canewdon has that many other places don't is documents of many witch's practicing in the village. During the 19th century there lived a man named George Pickingill who practiced a variety of ancient spiritual rituals. He operated in the village with no resistance from the locals and during his time, managed to set up nine covens throughout Essex, Hampshire, Norfolk and Sussex, and legend says he called the witch's to meetings at a sight close to the church with a wooden whistle. The sound the whistle made is one of the paranormal occurrences which people have claimed to have heard in the area around the church when no one is close enough to be making the noise. As for appearances of ghosts in the village almost all of the claimed sightings are that of witch's. There is a local legend in relation to spirit sightings which proclaims "Three of cotton, Three of silk". This means that if any of the ghosts of past witch's are present in the village, there will be at least 6, with 3 being of cotton (lower class), and 3 being of silk (upper class). The number of people who have claimed to have seen the ghost of a witch is huge, though most are likely just hype. The story surrounding the church is also the reason it is closed off around Halloween.The legend states that if walk around the church clock-wise 7 times, the spirit of a witch will appear before you. 13 times will make the person invisible, and if you were to walk around it anti-clockwise the devil himself will appear. Essex police section off the area at Halloween to stop drunken ghost seekers from causing any damage there in their attempt at testing the legend. As for other ghosts in the village there are claims of all other kinds of apparitions appearing, from world war soldiers to random peasants. Though one story which does seem to appear more than others is the sighting of medieval soldiers, thought to be from when Canute the great invaded the area in 1016. The remains of his camp are believed to be a hot spot for sightings and are marked out in an area of the village.